Like Lara, I like to eat too. I love getting to know a new country or city really well and finding out about all of its hidden treats. I’ve been in Colombia for almost five months now, getting to know every food choice in panaderias (bakery), fast food stalls, and typical restaurants across this nation. Even though I’m a vegetarian, I don’t always eat healthy. I love street food, and Colombia is full of bready, cheesy, fatty delights at every turn. On the other end of the spectrum, a unique, mind-boggling selection of exotic fruits and vegetables to experiment with are also readily available. The following recipe is a lovely balance of the two. 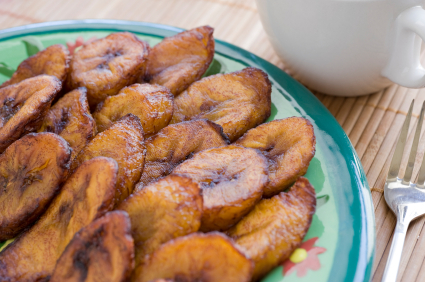 It’s fried, but it’s made from plantain, or green banana, so it’s healthy too. Patacones are often served along with beans, rice, and a salad in a set lunch meal. If serving them as a snack, you can cut up tomatoes and onions, add a bit of oil and salt, and serve it on top to add to the taste. First, peel the plantain and chop it up into small slices about 2 centimeter’s width. Next, heat up a generous amount of oil in the frying pan. Add the plantains and fry the pieces on both sides. Remove them from the frying pan. Next, smush two or three pieces together to form one. Refry them on both sides until they have a toasted appearance. The patacones can be as small or as large as you want. You can smush tiny pieces together, or you can smush them all together to make one large piece. Any type of flavored topping goes great with these: guacamole, the tomato and onion mix that I mentioned above, a bit of sour cream, or whatever else you’d like to try. Jasmine Stephenson is a guest blogger for An Apple a Day and a writer on the subject of medical transcription training for the Guide to Health Education. Wonderful article!We will be linking to this great post on our site.